The functions listed here are commonly used in the interpretation of MRI images. They can also be used to aid in the understanding of the functions and purpose of imaging performed at Bayside Standing MRI. 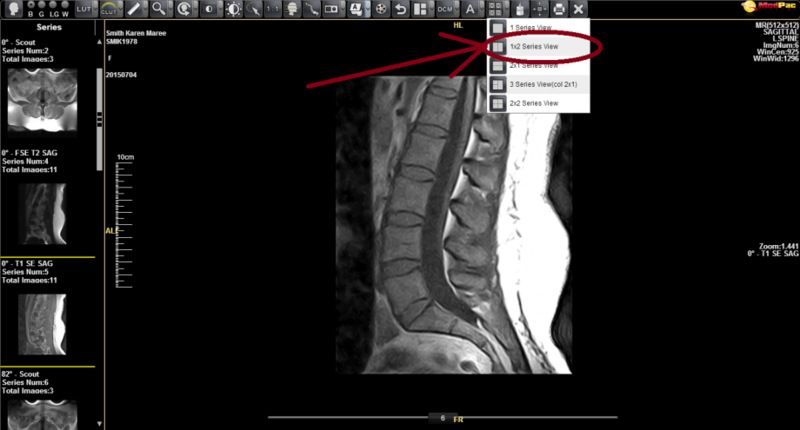 Scout lines are used in MRI to aid in pin-pointing the location of the slice shown being currently viewed. The scout lines can show the slice location by referring to a different view. 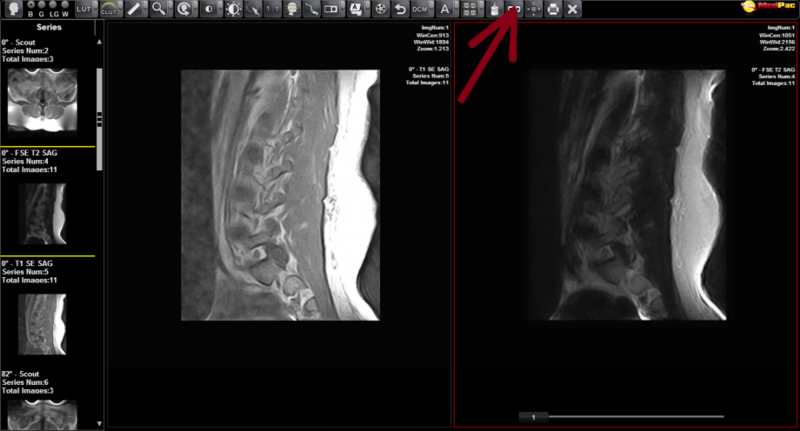 For example, the location of the slice of a sagittal view can be seen by referring to scout lines on the axial or coronal views. To view scout lines in conjunction with an MRI series, follow the instructions below. When viewing a sequence, change the viewing options to show 2 sequences at once. This is done by Selecting the sequence view drop-down arrow, and selecting ‘1X2 Series View’. Select the right hand viewing window so that it shows a red border. Drag and drop appropriate scout sequence to the right hand (red bordered) window. Click on the sequence on the left hand side (not the scout), then select the scout lines option. Start scrolling using the left and right keys on your keyboard. The yellow lines on the right hand side (scout) will show the approximate location of the slice. 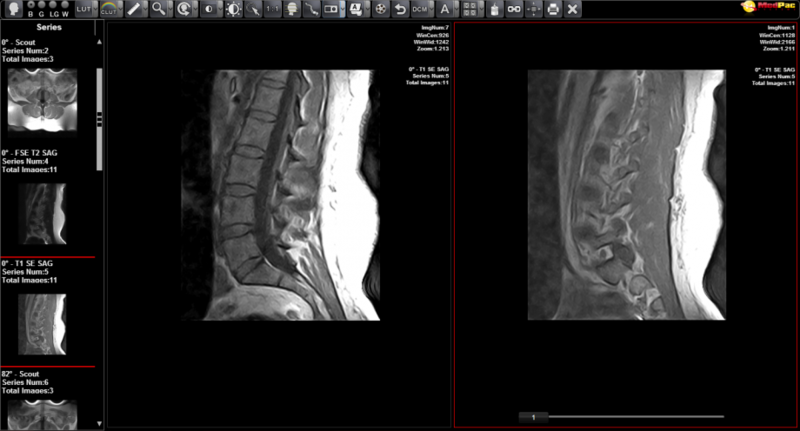 When viewing MRI studies, it can be beneficial to compare the T1 and T2 weighted image sequences for the same view. To compare T1 and T2 weighted images, follow the steps below. 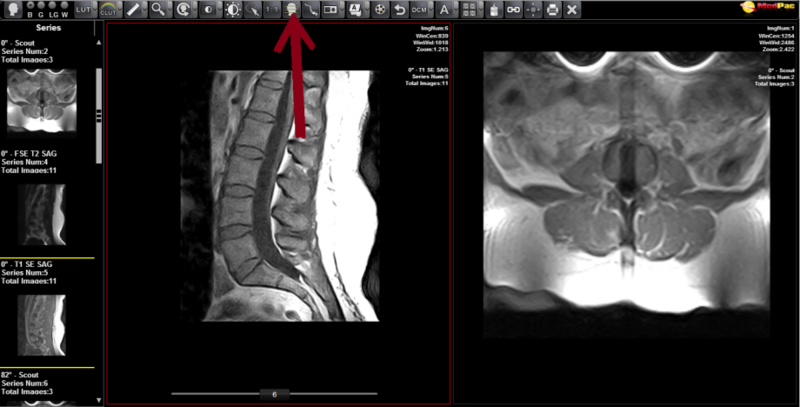 Select the left hand window (outlining it in red) and drag the T1 weighted image sequence from the sequence list to that window. 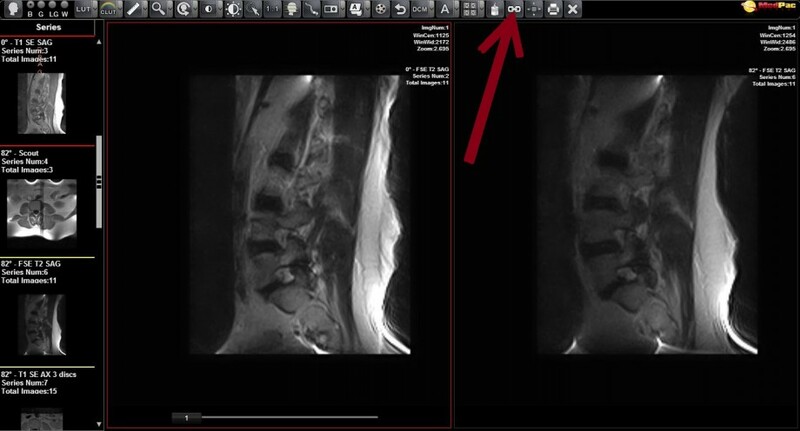 Select the right hand window, then repeat the process with the T2 weighted image sequence. When both sequences are on the first slice, click on the ‘Lock Scroll’ function. Use the left and right arrow keys to scroll between images. Many of the MRI studies performed at Bayside Standing MRI have an upright component, where some of the patient’s sequences are performed with the patient standing upright. This aids in showing the effect of the patient’s body weight against the extremity being studied and also allows for comparison between lying-down and upright positions. Much like with the T1-T2 sequence comparison, our online viewer can be used to compare the lying-down and upright sequences. 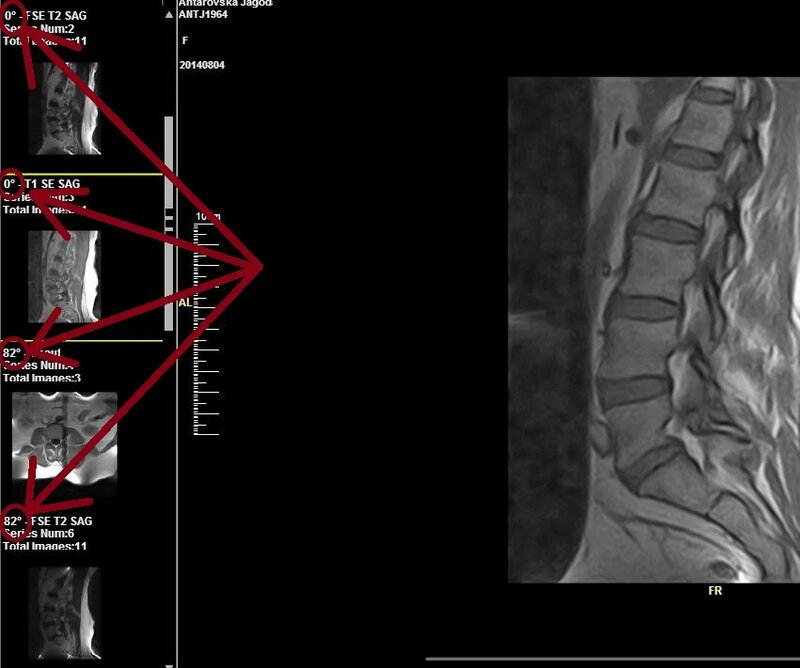 This is most commonly done with studies of the Lumbar Spine and the Knee. For more information on the importance of upright studies, click here. To compare recumbent and upright studies, follow the steps below. Identify the recumbent and upright sequences by looking at the labeling on the sequences in the list on the left hand side of the screen. Each sequence will be labelled with either 0° (recumbent) or 82° (upright). Select the left hand window, outlining it in red, then drag and drop the 0° sequence to it. Repeat the process for the 82° sequence in the right hand window. Use the right and left keys to scroll between slices, comparing the recumbent and upright sequences.